For the past eight years, China has hosted the barbaric Yulin Dog Meat Festival where dogs are slaughtered alive then eaten. Mum-of-two Cindi McNeil-Regan is doing everything she can to rescue them….but she needs help. Watching her 25 dogs bask in the rolling acres of land at her rescue centre in Somerset, Cindi McNeil-Regan feels a rush of pride. Many of them were once destined for slaughter at one of China’s horrifically cruel dog meat festivals- including Clover, a golden retriever and Ting, a Pomeranian-crossbreed. And this month, one of the festivals will take place – the 10-day long Yulin Dog Meat Festival – where they “celebrate” the summer solstice by killing up to 15,000 dogs to eat, often torturing them first as shockingly the festival goers believe the meat is more tender if the dogs are terrified before they’re killed. Following international pressure the organizers recently claimed dog meat will be banned from this year’s festival but Yulin Government Officers have confirmed that’s not the case. But Cindi has made it her mission to help some of the dogs of China finally live a happy life. Cindi says: “When I saw a photo of Ting I was horrified – he’d lost half of his fur, was blind in one eye and had a hernia. “He’s nearly 12, and the rest of his life will be happy. He’s so affectionate, he loves cuddles and rests his head on my chest. Thinking about how he was treated breaks my heart. 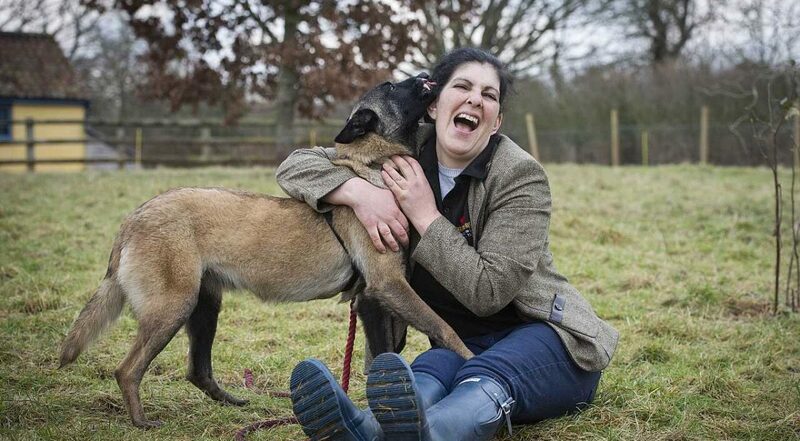 Cindi launched the Rushton Dog Rescue centre in Somerset in 2007, following the death of her partner, Timothy Rushton. She and her daughter, Zoe, 24, now dedicate their lives to helping dogs in Spain, the UK and China. She says: “Timothy loved animals and always wanted to start a rescue centre – so I fulfilled his wishes. My first dog was a beagle who needed rehoming from a pet shop and it snowballed from there. We’ve now rescued over 400 dogs! “It’s been a struggle from the start. Not only was I continuing with my job in sales, but I was delivering takeaways at night to cover vet bills before the centre was fully established – all while raising two children on my own. Continue reading the full article here @ Closer Magazine.